NEWPORT BEACH — Teams from around the world competed in the 49th annual Governor’s Cup International Junior Match Racing Championship at Balboa Yacht Club in July where Harry Price, Angus Williams and Tara Blanc-Ramos, from the Cruising Yacht Club of Australia (CYCA) on the east side of Australia, defeated Lachy Gilmour, from Royal Freshwater Bay Yacht Club (RFBYC )from Western Australia in a battle of the Aussies. CYCA had quietly worked their way up the ranks in their first Gov Cup. The first day of racing, CYCA won four races, losing only to Chris Weis of Del Rey Yacht Club. On July 22, they lost only to Scott Sinks of San Diego Yacht Club. After finishing the first round robin, they were one of five teams tied with eight wins. Prior to the final, it was a week of close calls as teams battled it out on the water. In the very close semi-finals between Balboa YC and Price, Killian had two wins and one loss after July 24. However, on July 25, Harry was able to win the next two races which put CYCA in the finals against the team from the other side of Australia. In the lighter air, which Harry had said he preferred, CYCA chose the side of the course which had more wind. In unusual tactics for Match Racing, the boats did not stay together. Gilmour, in first place to start, had chosen to race Weis first. RFBYC started Saturday with two wins, while Chris had only one. Gilmour was able to win the next race as well, which put CYCA and RFBYC in the finals. It was another beautiful but steamy day in Southern California. The few clouds that there were in the morning disappeared. The winds were lighter than earlier in the week, starting about 6 knots, and not growing much stronger. There were some swells later in the day with light chop. When the racers returned to Balboa YC, the winning team was towed in by the Race Committee boat and met at the entrance of the harbor by the Harbor Department boat, spraying water in an arch before them. The winners dove in the water as part of the tradition. They had also jumped in the water just after finishing the final race, leaving the boat to be rescued by one of the many support team members. The event kicked off July 20 with a welcoming banquet featuring introductions of each team, as well as the sponsors that made the event possible, the host families, umpires and volunteers. Racing began on July 21. A variety of events and activities were available for the racers in addition to the competition. Chet Purcell presented the Purcell trophy to the Chicago Yacht Club winners of the Purcell Sportsmanship trophy, Will Curtiss, Rose Edwards and Wade Wagner. They were chosen by vote of the racers and the umpires. This was the last year Balboa YC will use the Gov Cup 21 boats that were designed and used for this purpose since 2003. Designer, Alan Andrews, has designed a new and improved Gov Cup 22. Alan, a long-time member of Balboa YC, has designed many high performance racing and cruising yachts. The new boats are on order and will be ready for the 50th Annual Gov Cup in 2016.The age limit will change to under 23. 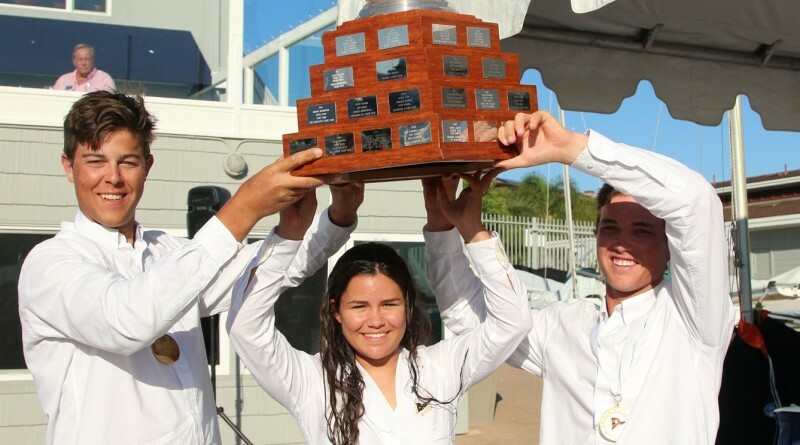 There will also be an Alumni Regatta, which should bring back some of the past racers who have gone on to America’s Cup, Congressional Cup, Olympics and other major competitions. For more information, visit balboayachtclub.com/GovCup.